Vasyl Lomachenko: The undisputed pound-for-pound king? Three world titles won at three different weights in just a dozen pro fights, a quite superb skill-set all his own, a willingness to fight the absolute best each and every time out. These are just a few of the accomplishments and the accolades of Vasyl Lomachenko, the new WBA/Ring Magazine lightweight champion. 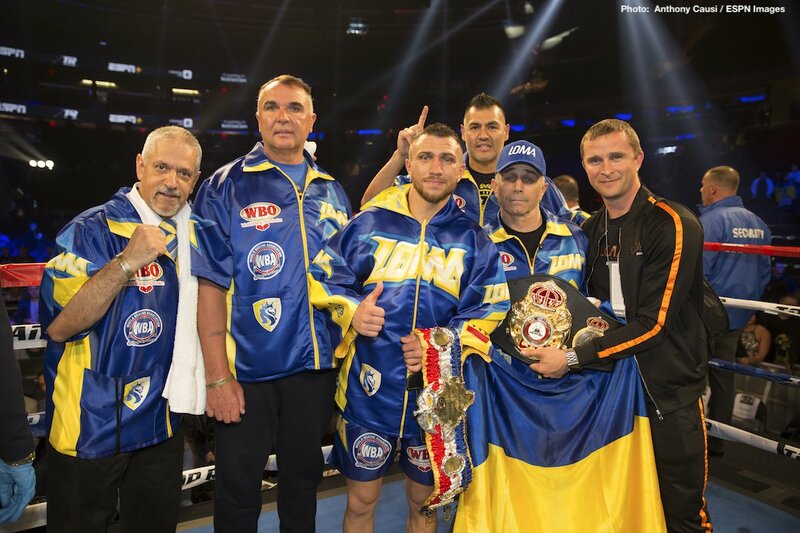 Faster than any other fighter in boxing history – faster than Floyd Mayweather, Manny Pacquiao, Thomas Hearns and so many others to have achieved it – Lomachenko has become a three-weight world ruler. And “Loma” might just be entering his absolute peak and prime. That said, and there may not be too much of a debate apart from in the minds of some determined fight fans, is Lomachenko THE undisputed best fighter on the planet today pound-for-pound? It’s getting increasingly hard to deny the Ukrainian southpaw the top spot. In fact it’s been hard to deny Lomachenko the distinction for some months now. Can you make a case for any other active fighter being more deserving of holding the lofty and mythical crown? 2: Gennady Golovkin, middleweight. Last Fight: KO 2 Vanes Martirosyan. Next fight: TBA – but likely to be the big rematch with Canelo Alvarez. 3: Terence Crawford, welterweight. Last fight: KO 3 Julius Indongo. Next fight: Jeff Horn for the WBO welterweight title on June 9. 4: Mikey Garcia, lightweight. Last fight: W12 Sergey Lipinets. Next fight: Robert Easter Junior in a WBC/IBF 135 pound title fight unification clash on July 28. 5: Saul Canelo Alvarez, middleweight. Last fight: Draw 12 Gennady Golovkin. Next fight: TBA – but very possibly the big return meeting with Golovkin. 6: Srisaket Sor Rungvisai, super-flyweight. Last fight: W12 Juan Francisco Estrada. Next fight: TBA. 7: Sergey Kovalev, light-heavyweight. Last fight: KO 7 Igor Mikhalkin. Next fight: Eleider Alvarez on August 4. 8: Errol Spence, welterweight. Last fight: RTD 7 Lamont Peterson. Next fight: Carlos Ocampo in July. 9: Naoya Inoue, bantamweight. Last fight: KO 3 Yoann Boyeaux. Next fight: a challenge of reigning WBA bantamweight champ Jamie McDonnell on May 25. 10: Oleksandr Usyk, cruiserweight. Last fight: W12 Mairis Briedis. Next fight: against Murat Gassiev In the final of The World Boxing Super Series. Next boxing news: What next for Hughie Fury? You are here: Home / Boxing News / Vasyl Lomachenko: The undisputed pound-for-pound king?